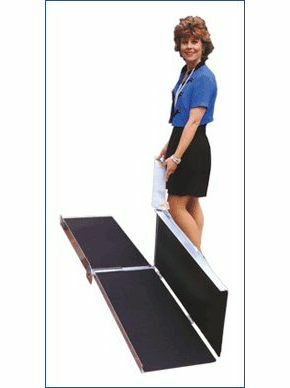 This wheelchair / Scooter mobility ramp is similar to the Aluminium Multi Fold ramp but splits into two parts making it even lighter to carry. 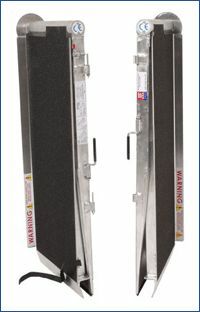 This two part scooter ramp splits into two parts, folds in half and locks with user friendly fastenings and can be carried just like a briefcase. Made of aluminium, this ramp is ultra light and portable to carry. This scooter or wheelchair ramp aids mobility wherever it is required. With a anti-slip, high traction surface, it is suitable for all weather conditions. With a generous 76cm (30”) width, we offer 5 different lengths; 152cm (5’), 182cm (6’), 213cm (7’), 243cm (8’) and 304cm (10’) so there is a perfect ramp for you, whatever your mobility needs.